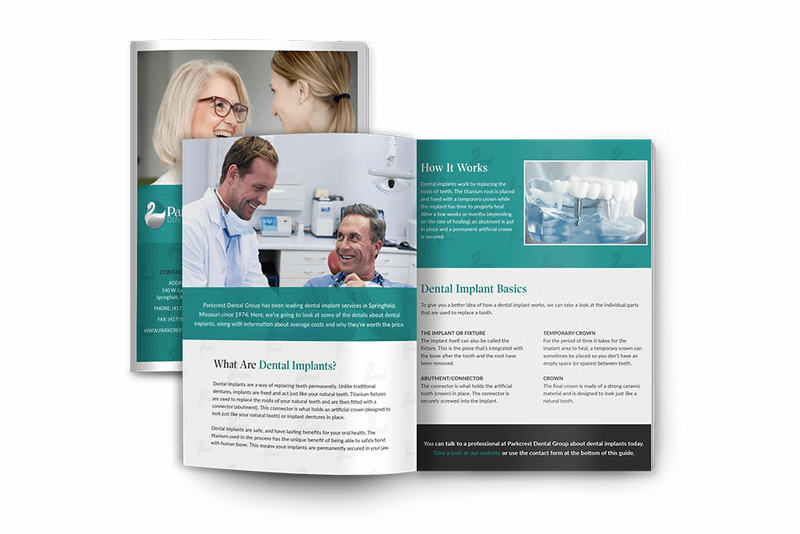 Download our dental implant guide! Parkcrest Dental Group has been involved in dental implant placement and restoration since 1974. The field of implant dentistry rapidly changes and has now become one of the most sought after services we provide. Dental implants are designed to replace single or multiple teeth. Parkcrest Dental Group has invested in a 3D radiology system that allows for the most accurate diagnosis and treatment. 3D technology has changed the field of implant dentistry forever. If you have been told in the past that implants are not an option, we welcome you for a consultation. New and varied dental implant placement techniques may open doors to treatment previously thought to be closed. If you are interested in the best option for tooth or teeth replacement, call Parkcrest Dental Group for your dental implant evaluation. Conventional bridges and dentures are not fixed to the bone, and can be unstable. This can make it difficult to eat or smile with confidence. Implants not only look more natural, but feel and act more like normal teeth, with a stronger biting force. And because they don’t directly rely on neighboring teeth for support, implants don’t compromise the health of your natural teeth. In fact, bridges are only expected to last seven to ten years, even less with root canals, whereas implants will typically last a lifetime. Want to learn more? Download our Guide to Dental Implants! Download our new dental implant guide!